Above is the official seal of the Blogger Pajama Party 2009, conceived and hosted tomorrow night by gorgeous blogger Sister Wolf. Grab the seal and blog your pajamas. Fluffy, soft, apron-style Hello Kitty "robe" with pink bow applique? Bought it. But I have to disagree with Kitty Corporate, this is no robe. Black Kitty goes to bed all night. 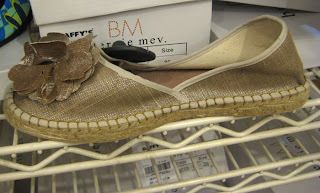 Aspirational espadrilles: make me wish I was going someplace exotic and warm very soon. Well, well, well Miss Fashion! Hello Kittttttty! Ha! you did well!! I substituted me with my son! meow back at you TP! note the very pink hello kitty! thanks, Make Do, I'm going to check out your substitute - so funny! Sal - i'm not even a hello kitty fan but couldn't resist! OMG!!!!! I am freakin' out! I can even adequately express my Hello Kitty love! that's so weird, i was just thinking about doing a post devoted to my jammies. i'm a bit ashamed to admit i know this, but japan in disneyworld's epcot center was selling those same hello kitty jammies for double the price! thank goodness i didn't buy them. I wish we had something like this in the Northwest!